Recent GeoCurrents posts have examined the political allegiances of various parts of California, focusing on Mendocino County. Mendocino today votes strongly for Democratic Party candidates, although not overwhelmingly so, like San Francisco. Voting history places Mendocino squarely in the Democratic camp for many decades, as the county has turned to Republican candidates only in landslide years, such 1972, 1980, and 1984. But although Mendocino voted for Democratic presidential candidates in both the 1960s and today, it has done so for different reasons. In the 1980s, the political geography of California experienced a wholesale transformation, one in which most rural counties switched from Democratic to Republican voting behavior. Rural Mendocino and neighboring Humboldt and Lake counties, however, stayed in the Democratic camp. 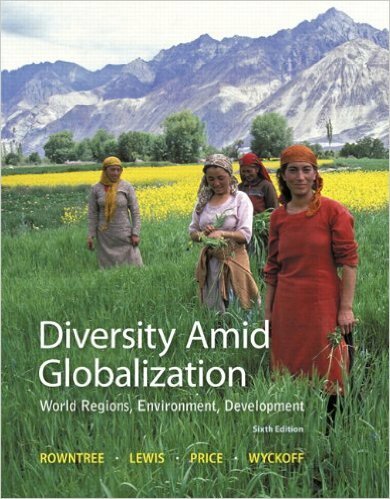 They did so largely because they had experienced their own demographic transformation in the same period. 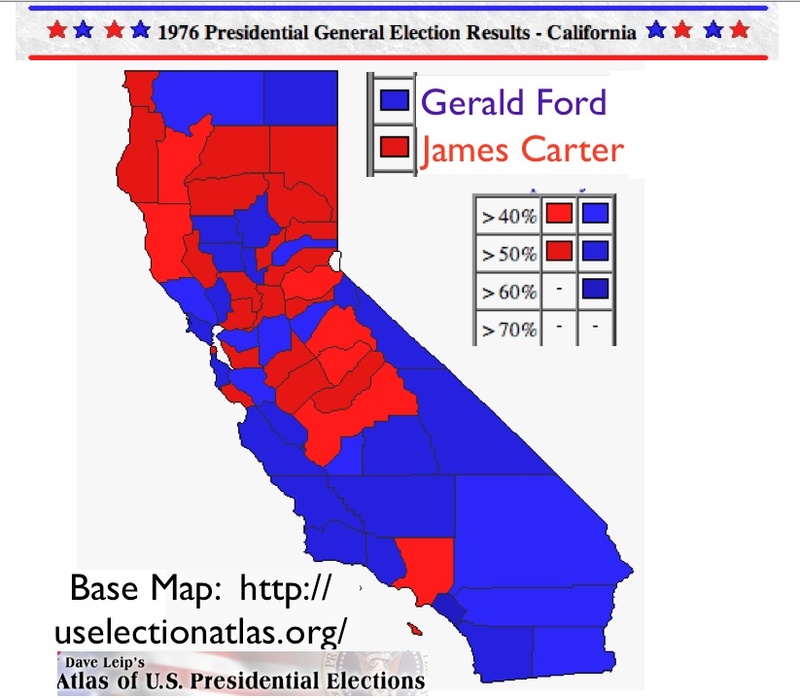 That change will be the subject of a later post; today’s examines the larger geographical transformation of California voting patterns during the 1980s. 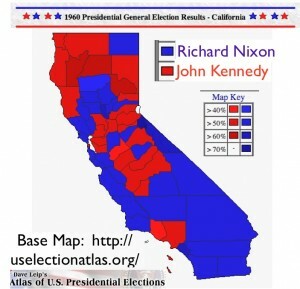 To examine California’s electoral shift, let us begin in the hotly contested election of 1960, when Democrat John F. Kennedy edged out Republican Richard M. Nixon to become President of the United States. As the election map here shows—in Dave Leip’s* reverse color scheme—Kennedy’s support was concentrated in traditional Democratic strongholds: urban, industrial counties (San Francisco, Alameda, and Los Angeles); agricultural counties of the San Joaquin Valley; and rural counties in the north dominated by mining and forestry. Nixon took many of the state’s farming counties as well—the Sacramento Valley in particular tended to support Republican candidates—but his real strength was in prosperous suburban counties, such as Orange in the south and Marin and San Mateo in the San Francisco Bay Area. In this election, Mendocino’s returns indicate its rural, working-class nature, as its economy was then dominated by logging, fishing, and small-scale farming. After the Kennedy-Nixon contest, the U.S. experienced several aberrant elections: in particular, the Democratic landslide of 1964 and the Republican tidal wave of 1972. Both contests reveal hitherto hidden patterns. In the Johnson-Goldwater election of 1964, the only Republican-voting counties in the northern half of the state were Sutter in the agricultural Sacramento Valley and sparsely populated Inyo and Mono on the east side of the Sierra Nevada. 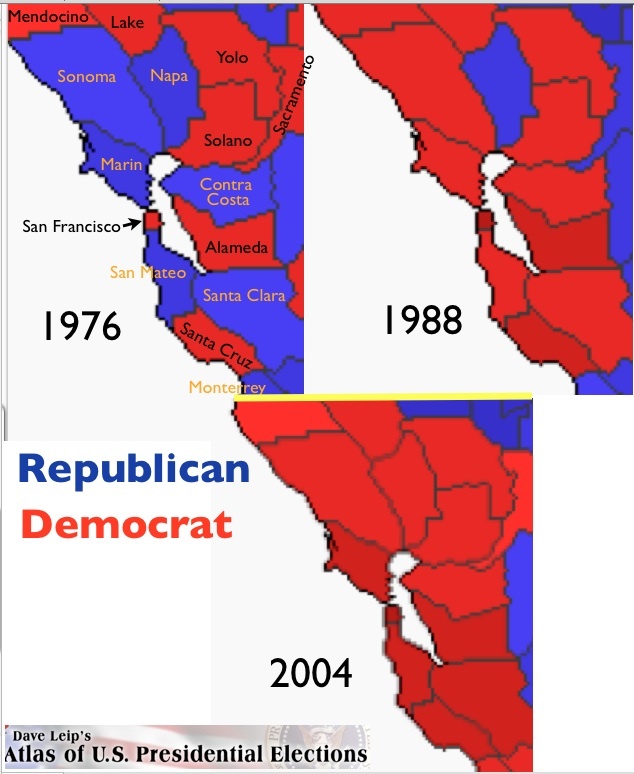 In the Republican triumph of 1972, when the Democrats leaned further left than they ever had, only San Francisco, Alameda (which includes Oakland and Berkeley), Yolo (which includes the University of California at Davis), and three mostly rural counties in the north voted for George McGovern rather than Richard Nixon. In 1976, voting patterns in California returned to roughly the same position that they had occupied in 1960. Democrat James Carter, an evangelical Christian from Georgia, was able to reestablish the aging New-Deal alliance, triumphing in urban cores, in roughly half of the agricultural counties, and in most of the mining, logging, and ranching areas of the north. Such a return to the older pattern, however, was temporary. In the next two elections, 1980 and 1984, Ronald Reagan almost swept the state. Reagan lost only three counties in 1980, and in 1984 he lost only five. One of the counties straying from the Republican camp in 1984, however, was significant: affluent Marin, just north of San Francisco. Marin had long been a Republican stronghold, but in 1984 it turned to the Democrats and has never looked back. 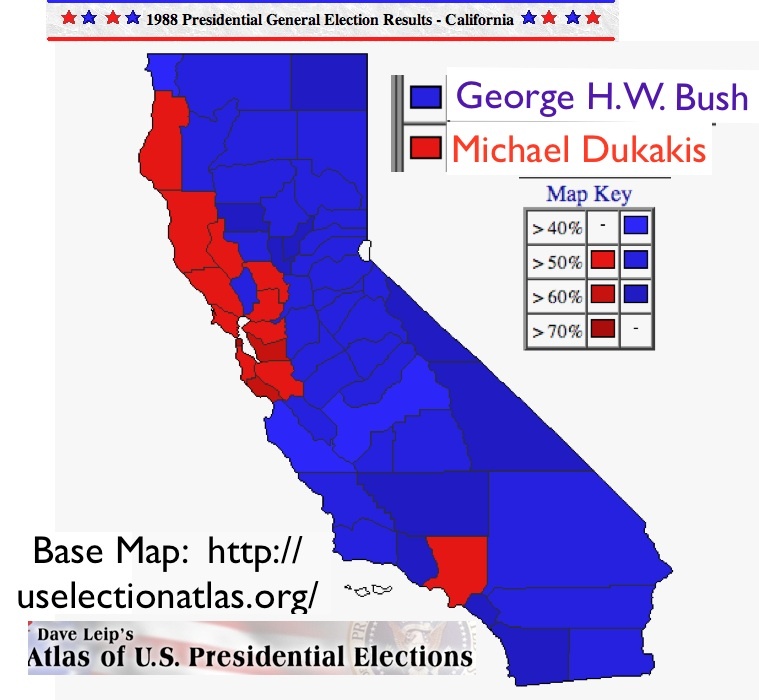 In 1988, when Republican George H. W. Bush defeated Democrat Michael Dukakis, other suburban counties in northern California followed Marin, as a new political geography of California appeared. Almost all the rural counties have stayed Republican ever since, with the prominent exceptions of Mendocino, Humboldt, and Lake. 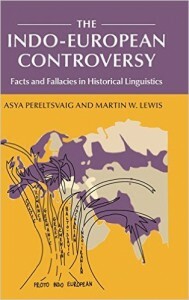 California’s geopolitical transformation was linked to local cultural evolution and the changes in the social orientations of the two parties, both related to the upheavals of the late 1960s and early 1970s. 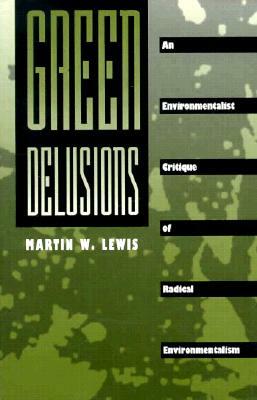 As the Democratic Party increasingly turned to environmentalism and feminism, its support in the interior portion of the state withered. As the Republican Party embraced religiously infused social conservatism, it lost the affluent and relatively secular suburban counties of the Bay Area. The county-level political reversal of California is strikingly evident in a comparison of California’s wealthiest county, Marin, with relatively poor, mostly rural Plumas County in the northern Sierra Nevada Mountains. In 1960, Marin gave Democrat John Kennedy only 42 percent of its vote, whereas Plumas delivered 62 percent. In 1972, when Nixon overwhelmed George McGovern, Marin gave Nixon a seven percent edge, while Plumas favored McGovern by two percent. Yet by 2008, when Barack Obama enjoyed a whopping 57 percent margin over John McCain in Marin, Plumas went for McCain by a twelve percent margin. In neighboring Lassen County, once a Democratic stronghold, McCain’s margin of victory was thirty-four percent. 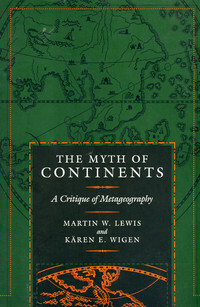 Mendocino county’s exception to the general rules of California’s recent political transformation will be the topic of a forthcoming GeoCurrents post. *The colors are reversed because Leip began his remarkable atlas before the New York Times published its famous “Red America/Blue America” map, in which Republican-voting states and counties are depicted in red, and Democratic-voting ones in blue.